Catch The Window! : You're Just Like your Father! Sometimes I look at my kids and know assuredly that they did NOT get switched at the hospital. 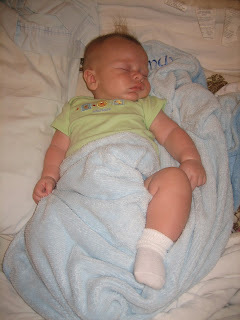 Here is baby Sam doing something that is SO like his Father - the "I need one leg out of my covers" thang. I was raised with the sheets tightly tucked into hospital corners, so never had this tendency. But Matthew does. He actually complained about my tidy sheet changing habits after we were first married. I'd change the sheets, and he'd come to bed and find the fresh, clean, top sheet tucked in all the way up to the pillows - like you see in every magazine ad or reputable hotel room. So it was funny to me when I walked in to check on the baby and saw that he too needed to let his leg "breathe." Made me laugh - cause I know that Sam is his fathers child! So funny! I love his little chubby leg. That's funny that Matthew also sticks one leg out, I hate having my feet covered (unless its cold outside). Something about tucked in sheets makes me feel claustrophobic. I think it has something to do with being the only child not harassed to make my bed!! Pre-marriage, I very carefully slipped under my covers, rarely moved while I slept, and making my bed took me .4 seconds. Now, as soon as Tyler gets in bed, he completely rips out all of the carefully tucked-in sheets. Ha. After so many years of that, the bed only gets made when I change the sheets twice a year. But seriously, it used to tick me OFF that I'd spend time to make the bed and he'd destroy it before he even started sleeping in it. And I do get the whole one-leg outta the sheets thing. I used to do that. My boys fight hard to get their arms out so they can sleep with them lying above their heads. Shut up, that is the cutest picture ever. What a sweet baby. I do the leg thing too, power to the people. Here, here for the "one leg out" sleep! I've been that way since I was a kid, and so has my dad. Being under tucked in sheets makes me feel like like I have to keep my toes pointed down in perfect ballet position. Go Sammy, Go! I think it is a man thing. Mine does the same thing. There is even a Seinfeld episode devoted to the subject.